Playtime isn’t just about having fun. It’s also the perfect way to help exercise your child’s fine and gross motor skills. Different games aid your child in learning to use both large and small muscles in their bodies. From playing tag in the backyard to putting together a puzzle, even simple types of play make major differences in your child’s life. 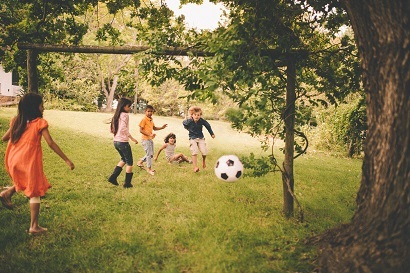 The more your child plays, the better their motor skills become as they grow. Plus, you get the joy of playing along with them. As adults, throwing a ball, stacking blocks or writing your name might not seem like a major accomplishment, but when you were a child, those were the stepping stones that helped you grow and develop physically and mentally. Both types are equally important, but you should make sure your child gets playtime that includes both. Fine motor skills focus on doing things with your hands. For instance, some early games to teach fine motor skills might involve playing with blocks, putting together pieces of a puzzle, clapping their hands or coloring. Gross motor skills involve the larger muscles in the body. Physical activities, such as running and crawling, help build these skills. Babies start out with raising their heads and eventually crawling. As children get older, they play ball, ride bikes and play jump rope. Make time for your child to play games that involve their hands, such as cards, puzzles, match games and blocks. Get your child active with bowling, tossing balls back and forth and having a fun dance-off as they get older. It’s never too early or too late to play with your child and boost their fine and gross motor skills.